Bike Cleveland | Working For Safe Streets | Gohio Commute Bike Month Challenge! 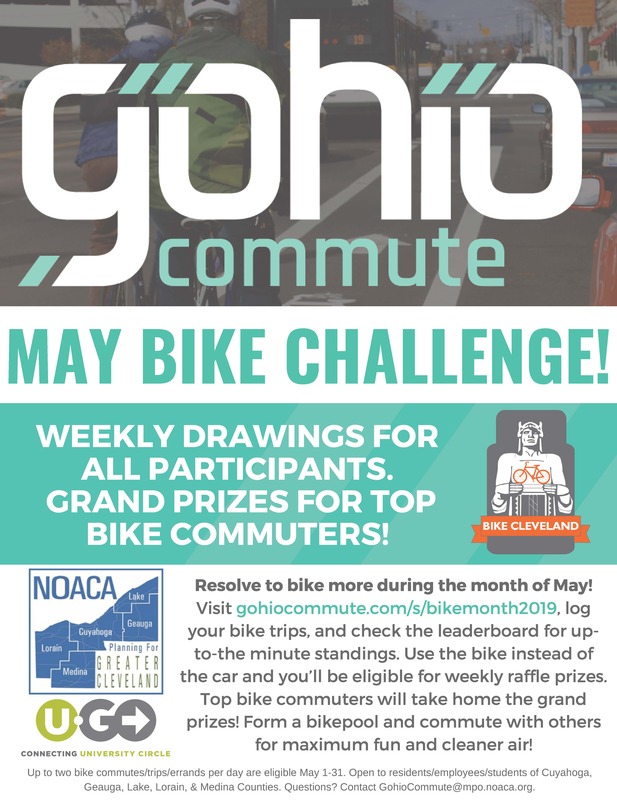 We have partnered with NOACA and uGO to invite NE Ohioans to join a friendly Bike Month competition on Gohio Commute! Ride your bike to work and use it for errands during the month of May and take the challenge! It’s easy! Just register on Gohio Commute, log your bike commutes during May (you can link your account to Strava for automatic logging), and follow the leaderboard for up-to-the minute standings. Up to two bike commutes/errands per day will count toward your standings. Use the bike instead of the car and you’ll be eligible for weekly raffle prizes, and top bike commuters (1st, 2nd, and 3rd place) will take home the grand prizes! Special thanks goes to our awesome local bike shop supporters for their gift card prize support! Drawings will be held in the event of ties. Form a bikepool and commute with others for maximum fun and cleaner air! Thank you to Beat Cycles, Century Cycles, Joy Machines Bike Shop, and Spin Bike Shop for their generous prize support! The small print: This challenge is open to residents/employees/students in Cuyahoga, Geauga, Lake, Lorain, & Medina Counties. If you have additional questions about Gohio Commute or need technical help with logging in and the like, please contact GohioCommute@mpo.noaca.org for more information.